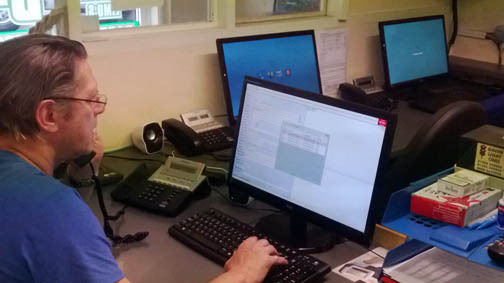 Greenlight Cars in Kent, who switched to Autocab and went live six months ago, have been delighted with their progress whilst enjoying a range of improvements to their business since the switch. Even in the first few days following the installation Trevor Parker, Director at Greenlight Cars, noticed some vast enhancements to the overall efficiency and performance of the business. Most notably, as far as Trevor was concerned, was a distinct reduction in the time spent on the accounting and in particular invoicing. In fact, as time progressed, Trevor recorded the accumulating hours that were being saved in processing invoices with Ghost accounts and compared them to the time spent on invoicing with the previous system. A most interesting discovery was made. They were saving approximately one and a half days per week. This was accompanied by a host of other benefits that were brought in with Ghost. “…When you take a leap of faith and change dispatch systems it’s a big step for any company no matter how large or small. The cost needs to be considered very carefully. The fact that it was actually cheaper to switch to Autocab Ghost than upgrade our old system made the “financial” decision very simple. However, we all know that whilst important, not many of us would make this decision based on finances alone. There are many more aspects to changing, reliability being one support being another and will I ever see this “rep” again? Greenlight Cars have been using ghost for 6 months now and I have to say that even after the initial euphoria we are still delighted. Chris Akinbile “the rep” rings me almost every week & pops in about once a month to see how we are getting on. We have now installed the Booking App and it has taken off really well. We get regular system updates. Not the ones that just make it work properly but really useful features such as “we can now text a job directly to our drivers mobile in the event of comms failure” this is really useful and was included in our free regular upgrade. This is a very powerful piece of software and sometimes we don’t all grasp everything the first time round. Chris Akinbile arranged further training for us and we are now firing on all cylinders and are about to install “Cab Exchange” another new feature.